It's okay if you've never heard of Hard Reset, the new single-player cyberpunk first-person shooter coming next month from Polish developer Flying Wild Hog. Up until a couple of weeks ago, no one had. It happens. It just doesn't happen often with a game this good being released this soon. Evolve PR is calling Hard Reset a study in shortened public relations campaigns. Rather than present the gaming public with the game and then spend a year or two trickling out videos and screenshots, Hard Reset is being promoted over the course of three months, beginning with a single screenshot, a teaser trailer, and then a gameplay trailer. The game was first announced on July 13. It's coming out next month on the PC. Can a Single Screenshot Make You Want To Play a Game? You can understand how this can be confusing for today's game journalists, so used to learning about new titles at least a year in advance. I wouldn't have expected the first trailer to be out by now, let alone a playable preview build. Bezoar City stands as the last bastion of humanity in the grim future of 2436. The dirty streets reek of the loss of hope, littered with refuse, decorated with fading graffiti, and dotted with scraped and dented hovercars that hint at bright and shining 50's-era futurism beneath their rusted exteriors. Neon glows amidst the decay, advertising products and services that once mattered. Now only survival matters. It's a familiar world, with a familiar plot. The machines have slowly taken over the planet, robotic hordes systematically wiping humanity from existence. It's The Matrix, only instead of the artificial intelligence harvesting people for power, their attempting to access people that have already harvested themselves. In a place called The Sanctuary the digitized personalities of billions of immortality-seeking humans – the ultimate neural network – is the prime target of a machine intelligence attempting to transcend the limits of its artificial brain. The plot may be The Matrix, but the setting and characters are more reminiscent of another grungy future tale: Blade Runner. Major Fletcher is a cartoon version of Harrison Ford's Deckard in the game's comic book style animated cutscenes, A security officer for The Corporation, he defends The Sanctuary from the machines not out of any great love for humanity, but for the paycheck. As the game opens he's sitting at a bar getting ready to drink away the time between shifts when an emergency call (humans down!) sends him back into action. Fletcher is deposited in a dirty back alley, tasked with investigating the cause of the disturbance. And what a back alley it is. Dark and moody with the odd hint of neon or blue crackle of electricity, the street before me is littered with refuse, bits of broken machines, discarded gas canisters, and other odds and ends. Using the game's primary firearm I unload a few bullets into some garbage, sending it skittering down the alleyway. Physics, check. I fire a bullet into one of those gas canisters. It shoots like a rocket across the ground and explodes into a wall. On the wall is a metallic electric panel that, damaged by the explosion, sends sparking blue light arcing across the asphalt. Just in time for the first enemies to appear. The tiny two-legged machine creature hops towards me, only to get caught in the electrical trap, exploding into bits. As it falls apart I catch a glimpse of what looks like some sort of circular saw, coated with blood. Ouch. Despite the menacing weapon, the tiny robot was almost comical in its movements. How could these little things present a threat? A few turns through the alley I find out. These things swarm. It's a sight to behold, dozens of tiny-but-deadly little robots cresting a pile of refuse at the limit of my vision, blurred at a distance but coming into sharp focus as they come closer, leaping over obstacles like a swarm of mechanical fleas. Some have propeller blades instead of saws. Others are globes that explode when they get close. They're so pretty I almost forget I have a pair of powerful weapons at my disposal. Hard Reset starts the player with two weapons, one a bulky mechanical gun, the other an energy weapon that generates a glowing globe of electricity mid-barrel. Both are incredibly effective at dispatching the tiny creatures in their default state. As you play through the game, however, you collect currency that can be used to upgrade both weapons at kiosks littered throughout the levels, not only increasing the weapons' stats, but unlocking entirely new configurations. The mechanical gun shifts with a spin of the mouse wheel, becoming a shotgun one second, a grenade launcher the next. The energy gun's spherical bullets transform into an electrical arc, or cracking electric bombs. It takes a combination of these weapons and the game's environmental hazards (hello, exploding barrels) to make my way through the first level, unlocking secrets hidden behind destructible walls and mowing down waves of smaller foes. Soon I'm facing larger bipedal creatures, tough bastards that like to charge, barreling Fletcher to the ground. My favorite moment in the game, however, comes during the second level. I'm crossing a glass-covered bridge between the city sector and a derelict hospital, having just taken out a particularly tough group of enemies. I jump over the tangled remains of a school bus and land with a clear view of world surrounding my play area. Once-shining buildings tower into the atmosphere, seemingly suspended in the air. Neon signs flash defiantly through the smog-filled air. A break in the tunnel exposes me to a dirty wind, hinting at the desolation beyond. The world outside is ruined. No wonder Fletcher drinks. And I'm still relatively early in the game. I'm holding out on facing off against the enemies in the gallery until I have a build that doesn't feature a giant watermark in the middle. At this rate, I might already have it. 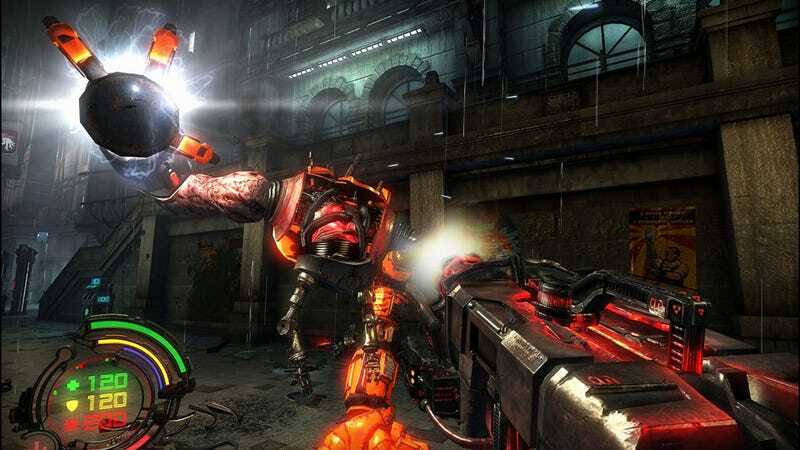 Hard Reset is a highly-polished game, filled so many graphical bells and whistles that Luke Plunkett, upon seeing some footage I can't share with readers (yet), said it resembled a tech demo. I've a feeling he wasn't being kind, but I like the look. The gunplay is fast and fluid without being too loose, the enemy behavior is downright diabolical at times, and the levels are riddled with secrets waiting to be discovered. It's got that single-player shooter vibe you get from games like Half-Life, where the developers don't have to worry about balancing weapons for multiplayer matches and can just concentrate on making an enjoyable solo experience. It's the sort of game I would have waited years to play. You only have to wait a month.